Monthly concert subscription service Jukely has raised $8 million in a seed extension round from existing investors to expand into at least 20 more cities in the next year. The round was led by previous investors Northzone and former Warner Music executive Alex Zubillaga’s 14W, with additional participation from Larry Marcus, Hany Nada, Lyor Cohen, Maiden Lane and GroupMe founders Steve Martocci and Jared Hecht. This brings the total investment up to a healthy $11.3 million in seed money. Jukely launched out of the Techstars NYC 2013 accelerator program as a sort of matchmaker for music lovers. Those into new and unique bands could go on the site and find those with similar tastes to go to concerts with. 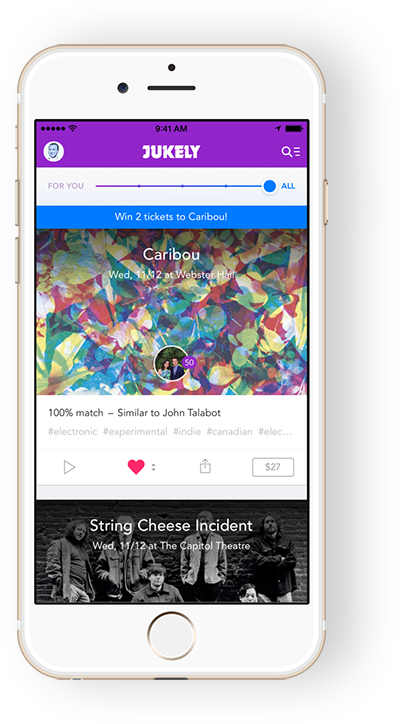 The startup began offering music lovers Jukley Unlimited earlier last year, which is an opportunity to go to an unlimited amount of concerts with lesser-known bands for $25 per month. The Unlimited idea caught on in New York City and Jukely quickly expanded the service to 10 U.S. cities – including New York, Los Angeles, San Francisco, Austin, Chicago, Miami, Toronto, Seattle, Philadelphia and Denver. “The service has proved to generate additional revenue and is clearly expanding the market for the live music industry by getting music lovers to attend shows they normally wouldn’t go to see,“ Jukely co-founder Bora Celik said. According to Jukely, subscribers go to 2-3 shows per month on average, with 65 percent of them going to see artists they’d never heard of before. While there are plenty of recognizable bands listed on the Jukely app, the Unlimited portion offers a much more select set of bands you’ve probably never heard of (or maybe you are just so cool you have). The new funding will allow Jukely to hire people in both marketing and engineering and double the current team of 15 in order to expand the unlimited service to more than 20 cities in both the U.S. and Europe. While Celik did not want to mention where the subscription service might be available next, he did talk about an upcoming London trip in the same breath as the number of cities he hopes to expand to, so London could be next.